If I had to pick an ethnic food as my favorite it would probably be Thai food. I love spicy, and I love the layers of flavor that Thai food has; spicy, sweet, and tangy. Near my workplace there is a Thai food restaurant; called Sweet Lime that has the MOST AMAZING Thai limeade. Ever. That limeade haunts me. I can’t stop thinking about it. It’s a little tart, but mostly sweet with an undertone of something herbal. I will be at my desk at work and suddenly I start craving it. The only problem is that it’s about 5 blocks from work and other than lunch time it’s not like I can zip out to get some. The first time I had it, I tried to get the secret from the woman on what was in it that made it so good. She coyly responded by saying “Oh, we make it fresh everyday”. Yes, I could tell it was fresh but that was not what I was after. I just KNEW there was some secret ingredient in that darned limeade but she was not going to tell me. I was picking up lemongrass or something herbal. I was not getting mint right away but later after some gentle probing from the waiter he admitted it was mint. I had already tried to whip up a batch at home using just lemongrass and it was pretty good on it’s own, but the mint definitely makes this refresher zing. I’m happy to say it tastes just like the limeade at my favorite restaurant. Here it is. 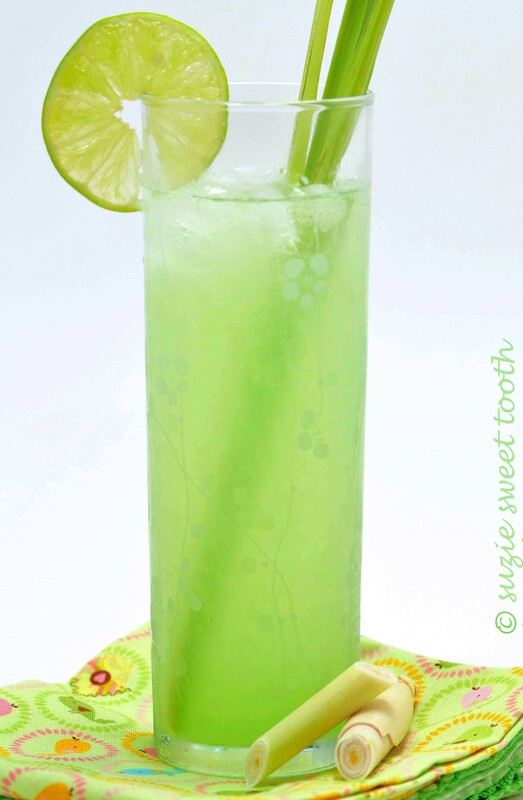 Lemongrass minty limeade. 1. Prepare the lemongrass by washing and removing the outer tough 1-2 leaves only. Chop off the fanned like top portion. Take the back of a chefs knife and “bash” the lemongrass with the back of your knife to breakdown the grass a bit, then chop it into one inch pieces. Combine 2 cups water and 2 cups sugar in a pot. Add in the chopped lemongrass and mint. Bring to a boil and then decrease to a simmer and continue to simmer for about 5 minutes while stirring the lemongrass and mint. Turn off the heat and let the syrup steep for 7 minutes. Strain out the lemongrass and mint. Chill the syrup in the refrigerator while you juice the limes. 2. In a pitcher combine the remaining 4 cups of water, lime juice and about 3/4 of the cooled syrup. Stir well. Taste and add any remaining syrup to taste. I ended up using all except 1/3 Cup of the syrup. Serve limeade over crushed ice and garnish with lime slices and fresh mint if desired.